Starting Friday, June 15th at 9pm ET until Sunday, July 1st at 11:59pm ET! Steal all twelve artifacts from the vault, and turn them over to the Ophidian Cabal Ringleader for a unique carrying case that will hold 10 of any one item. Store white crystals or cobbling ornamentations, ayanad crystals or pothinir grass. All items inside the container stack much like the gem jars that alchemists have used across Elanthia. Find the blood crystal, and the Ringleader will up his ante quite a bit -- trade your chest for a sack that holds 10 of any 10 items, and find any number of expanders within the sewers beneath the village that will increase both capacities up to a max of 100. Expanders can also increase the max weight of the container, as well as give up to 100% weight reduction. Containers do not start with any sort of reduced weight, so you’ll want to try your luck in the sewers! If stealing isn’t your modus operandi, than perhaps you’ll want to work with the Silent Investors. Their interests are to protect the vault within the bank and keep out the Ophidian Cabal. Joining their ranks, you’ll be eliminating the threats within the bank before they are plundered! Maybe you’re neither a thief or a vigilante. Maybe you have a darker route. Seek the Poisoned Heretics, a band of assassins, who wish to stop the Silent Investors entirely. While the Silent Investors and the Poisoned Heretics battle it out for control, the Ophidian Cabal slinks behind to steal the wealth and power for themselves. Which side will you endeavor to support? Or will you play them all for fools and keep the riches for yourself? A new legendary bloodrune: Vesperti! Ode to Resistance has been updated to include more armor types. Sewers Updates: New collectible drops, expanders. Small amounts of field experience now awarded per search. Arena Updates: Time recording to let you know about your last match and your fastest match. Challenge your friends (and foes) to see who can shred through all 25 enemies in Duskruin Arena. Taking the place of the pendants is an indigo RPA orb. High End Scrip Shop: An assortment of new and highly sought after items will make their way into the shop! Certificates for BLINK weapons, VIAL flares, ENCHANTING, and much more! 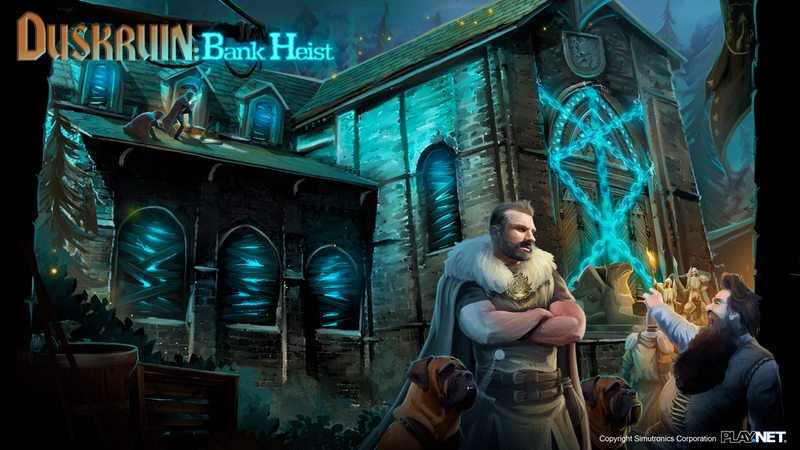 The Bank Heist is a unique adventure that will have some combat and minor puzzles. You’ll be awarded with bloodscrip and loot. There are also some interesting items you can be awarded for participating in the heist! A rat-shaped vial: Rat pheromone to help attract rats in the sewers. A dull grey rabbit's foot and a silky white rabbit's foot: Boost your chance for loot in the sewers. Sphere bombs: Combat aids for the Arena. To get started you’ll want to seek out one (or all) of the three hideouts throughout Bloodriven Village. Be sure to have a stamped voucher to get started! The heist starts this Friday, June 15th at 9pm ET. Which path will YOU choose?